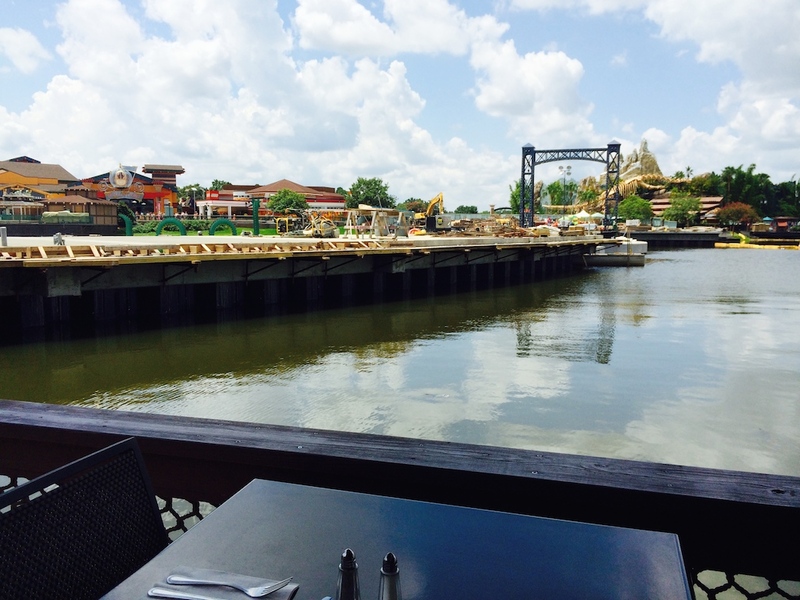 In part one of this photo tour of Downtown Disney we covered the West Side and all the walls surrounding Pleasure Island. 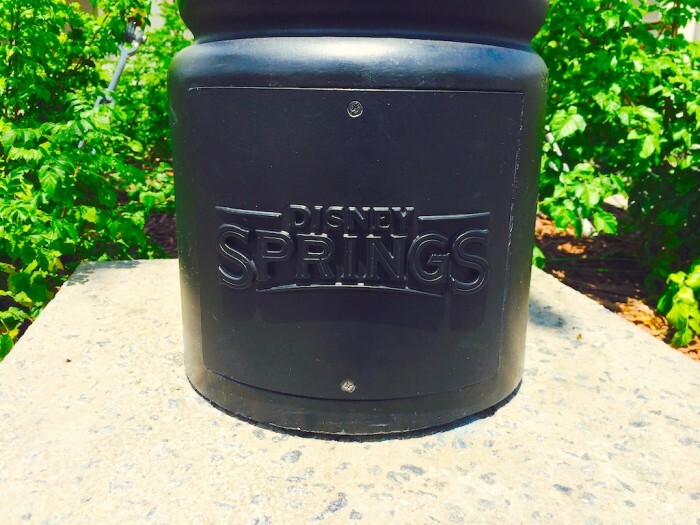 We start off part two with one of the only references to Disney Springs that you will see in the entire Downtown Disney area. 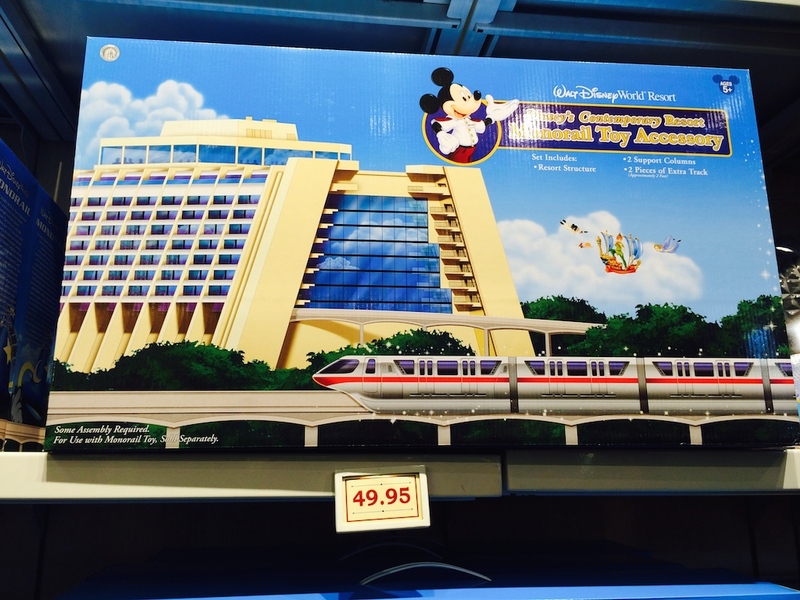 Even the concept art doesn’t have “Disney Springs” on it. 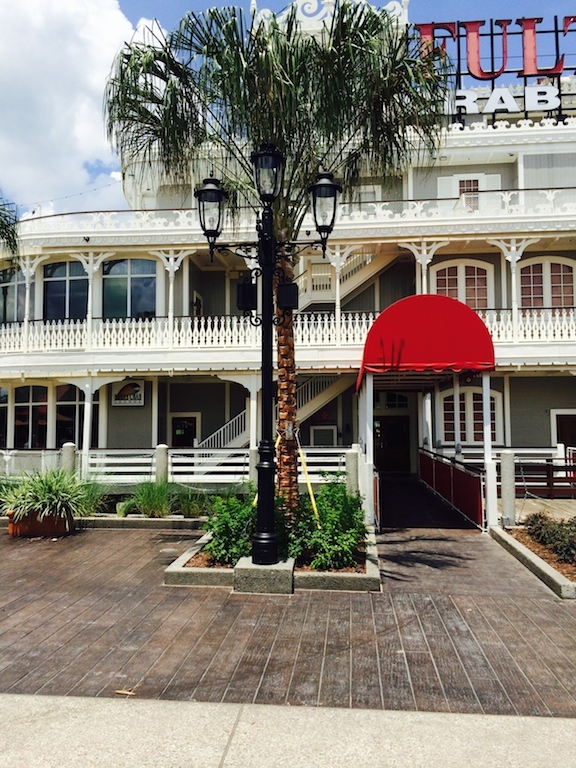 Several lampposts outside of Fulton’s Crab House were emblazoned with the Disney Springs logo earlier this spring. 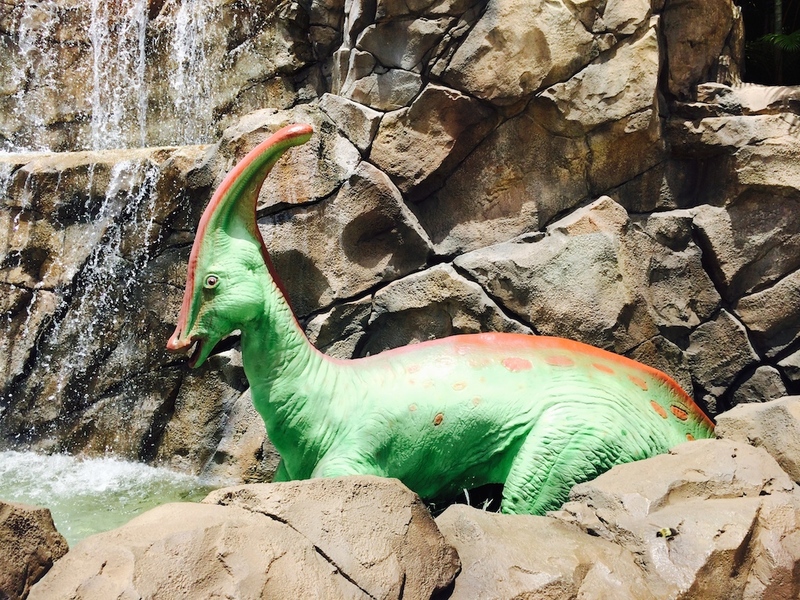 There is actually a decent amount of photo ops throughout Downtown Disney, including this dinosaur and waterfall in back of the T-REX Cafe. T-REX may have several faults (it can be very loud and expensive), but there is no denying that the overall theming of the restaurant is something that would fit perfectly into any theme park. The bar area is absolutely gorgeous with a gigantic octopus, a huge aquarium, and cool jellyfish lamps hanging from the ceiling. I stopped in to see the current status of the fish tank that sprung a leak several months ago. On my last visit there was a large scrim around the tank, but this time the scrim was gone, and the tank appeared to be fixed. 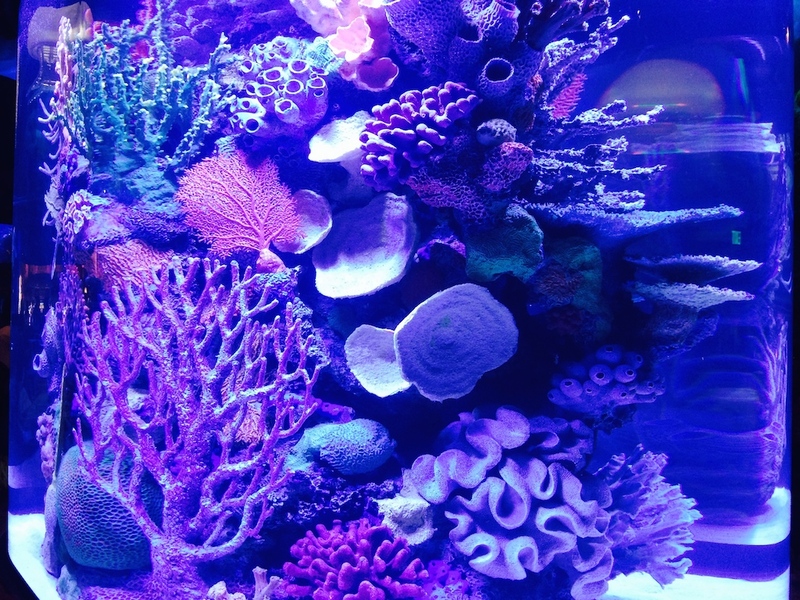 The tank, itself, was filled with water, but there were no fish inside. 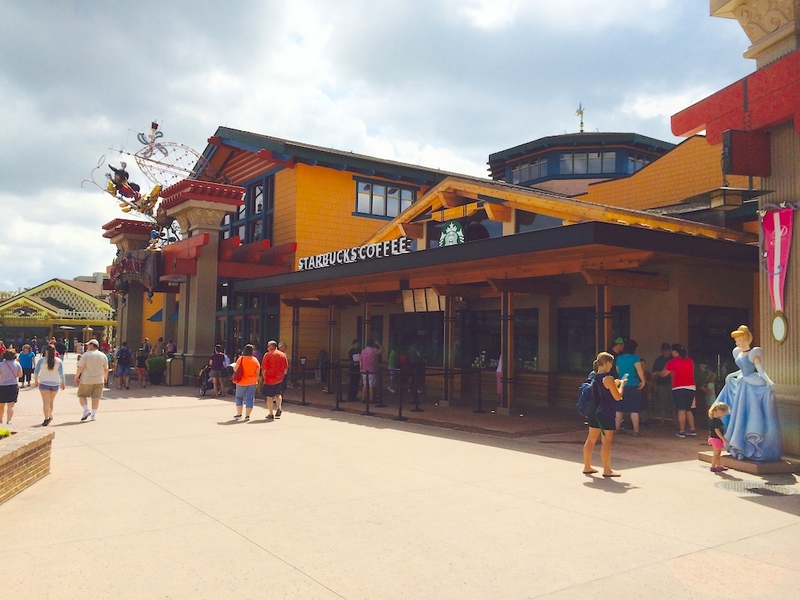 Next stop is the World of Disney store, with the new Starbucks out in front open and serving guests. 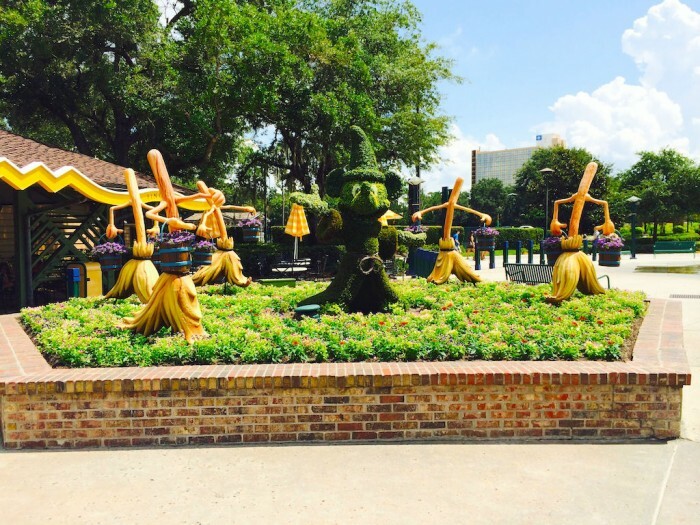 These “Theme Park Tagalongs” blew my mind. 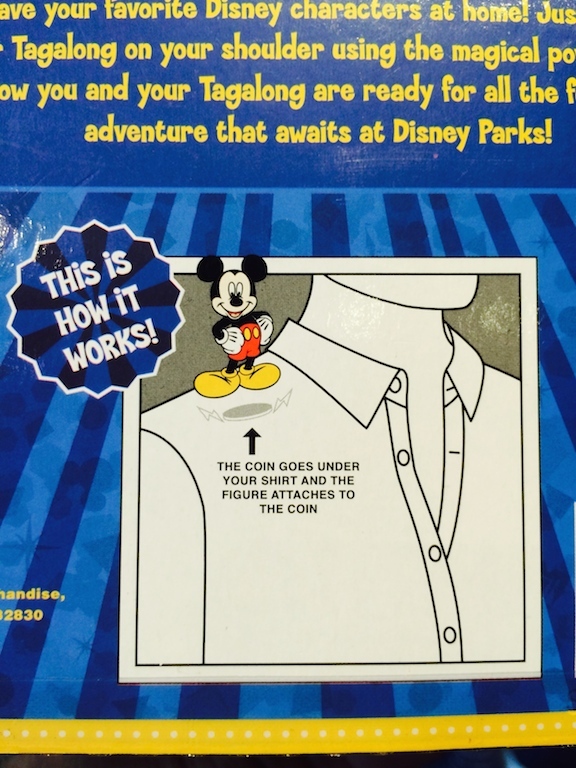 The directions say you place a coin (which you can see located at the top right of the package) under your shirt, and the figure sits on the outside of your shirt, attaching to the coin by use of a magnet. What I didn’t understand is this, how does the coin stay on your shoulder?! 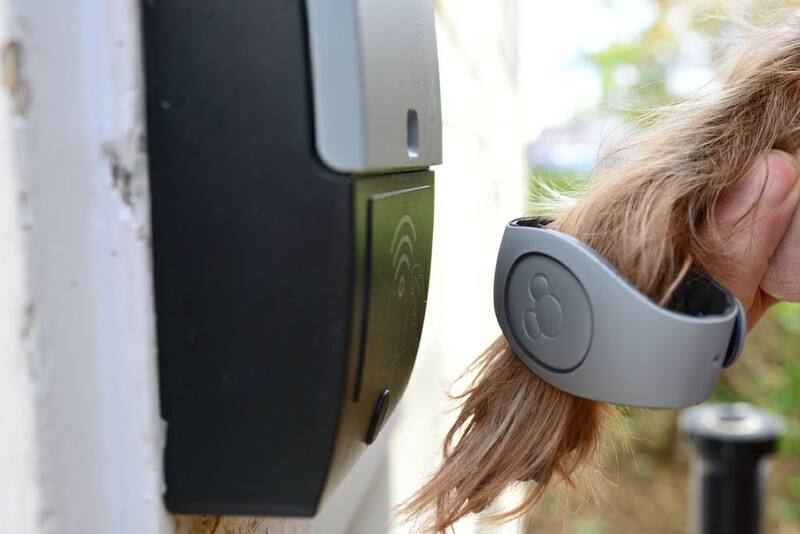 We had a heated discussion about this on the Pardon the Pixie Dust podcast, with my cohost making a very strong case that I don’t understand how magnets work. However, I am convinced that as soon as you start walking, these figurines will tip over as a moving human body is not like a refrigerator. I am now going to purchase some Tagalongs and do a scientific study to prove this theory. 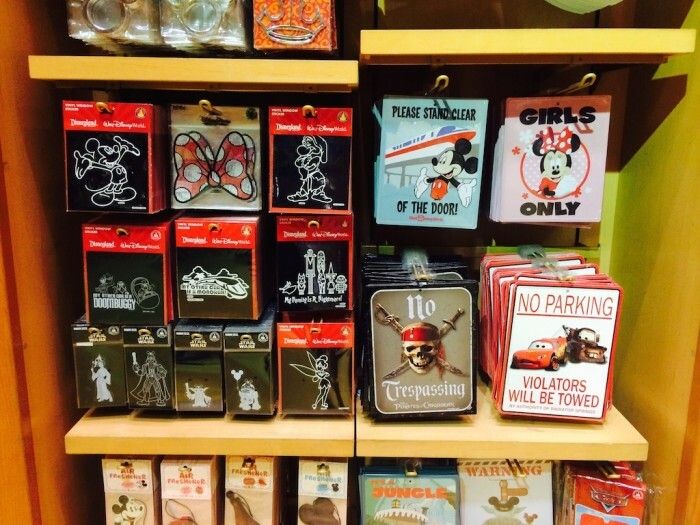 I will report the findings on my next Downtown Disney photo report. 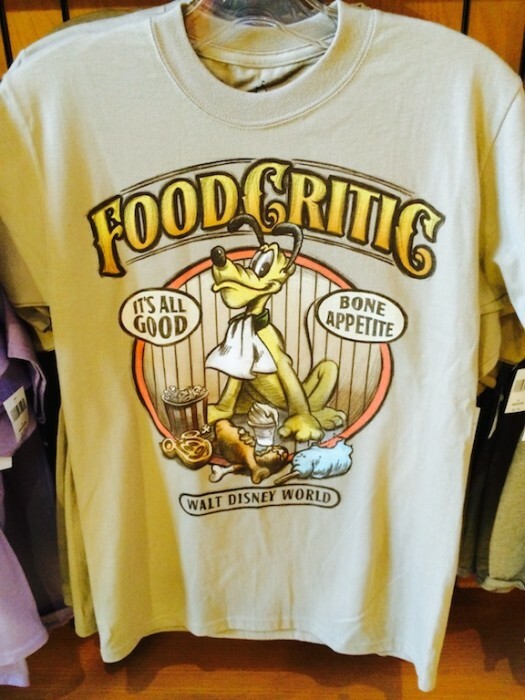 This is one of the five greatest pieces of Disney merchandise I have ever seen. 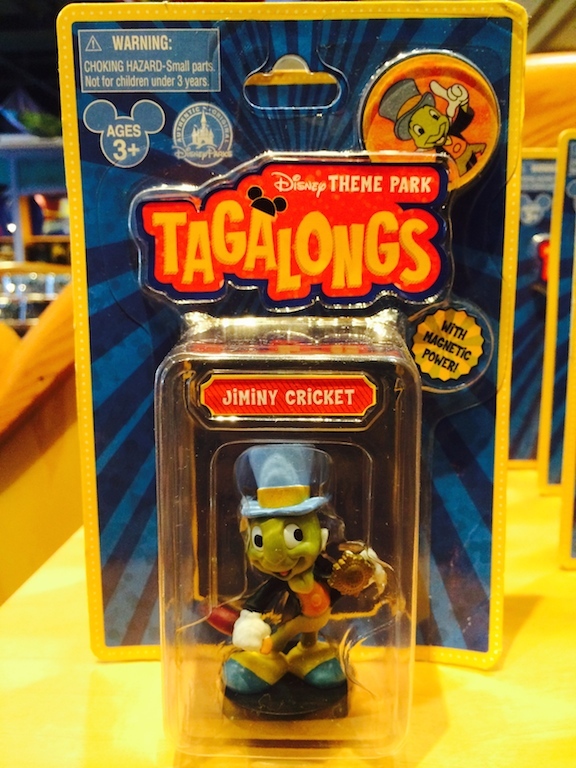 This Jiminy Cricket Tagalong is also a five star idea. If these Tagalongs work, and I don’t think they do, there are some neat concepts I would definitely buy, including Rocket Raccoon, birds from the Enchanted Tiki Room, and characters from A Bug’s Life. Duffy the Bear as Steamboat Willie plush. I expect I’ll be seeing this at the Disney Outlet Store sooner or later. 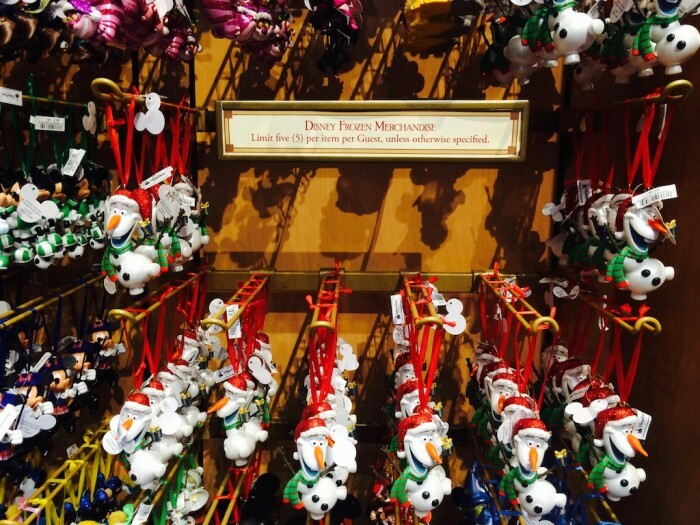 While there was very little Frozen merchandise in the store (most of it is being routed straight to Wandering Oaken’s Trading Post in Hollywood Studios), the items that were here had a limit of five per guest. 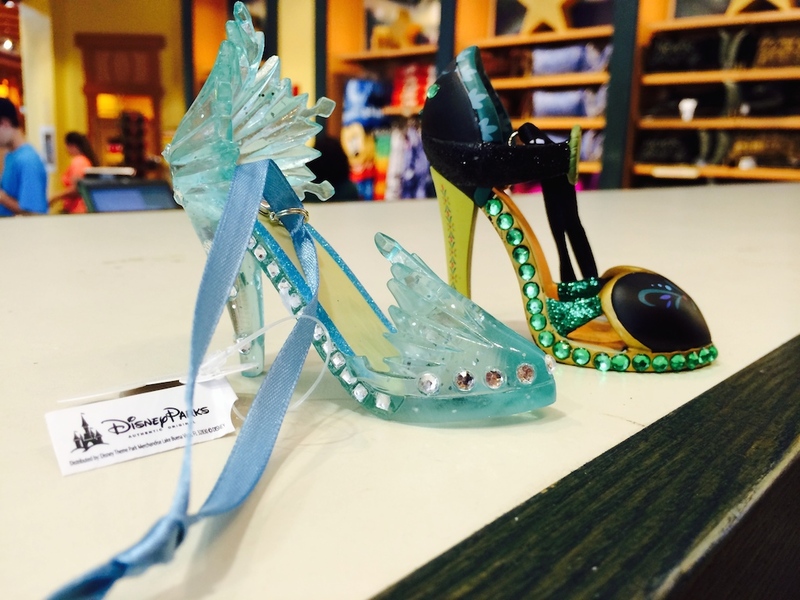 For some reason these Anna and Elsa shoe ornaments were on the bottom rows of a huge ornament display area in the back of the housewares section of World of Disney. If they had been put in the main area of the store with the other princess items, I imagine they would be completely sold out in less than a half hour. This section with car accessories had some interesting items. 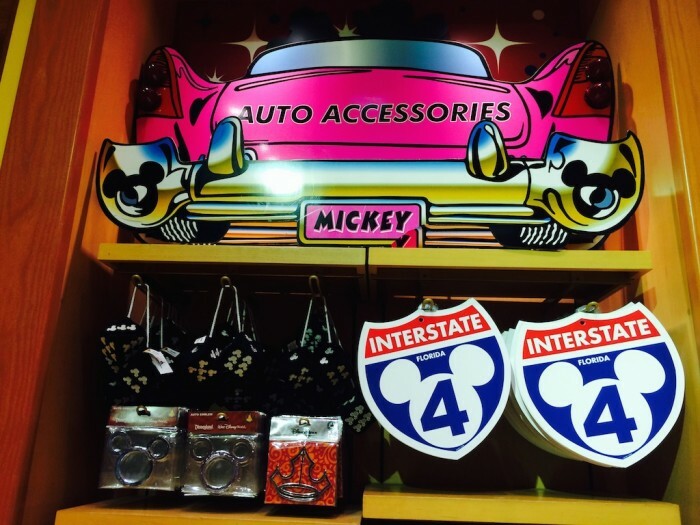 I’ve always like that Mickey I-4 design. 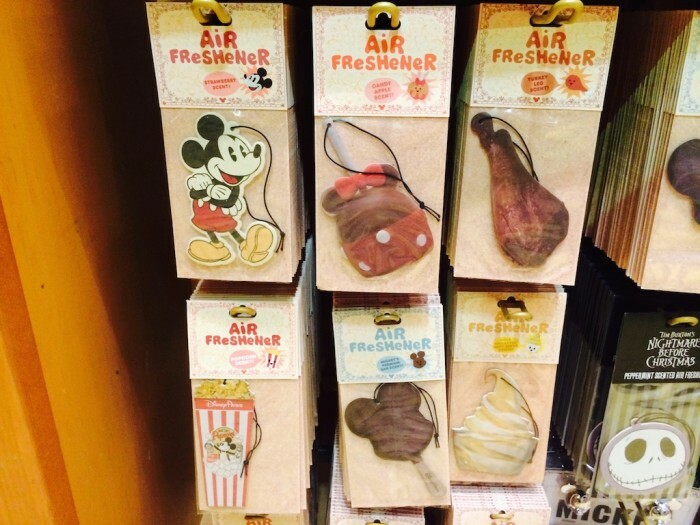 Car air fresheners. What exactly does Mickey Mouse smell like? Let’s take a look at some t-shirts. Several of these have been around at World of Disney for a while, but they stand out from the rest. I can’t explain it, but I find this Park Hopper Mickey shirt to be very charming. 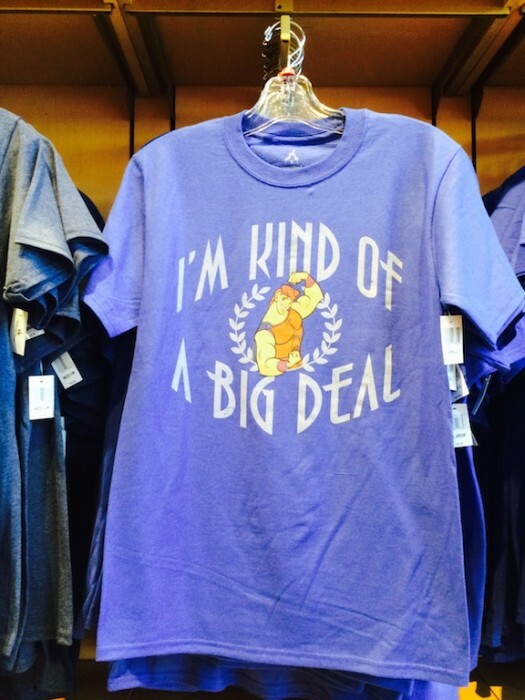 Pretty much all the shirts you see range between $21.95 and $29.95. I think this Disney Food Critic shirt works on multiple levels. 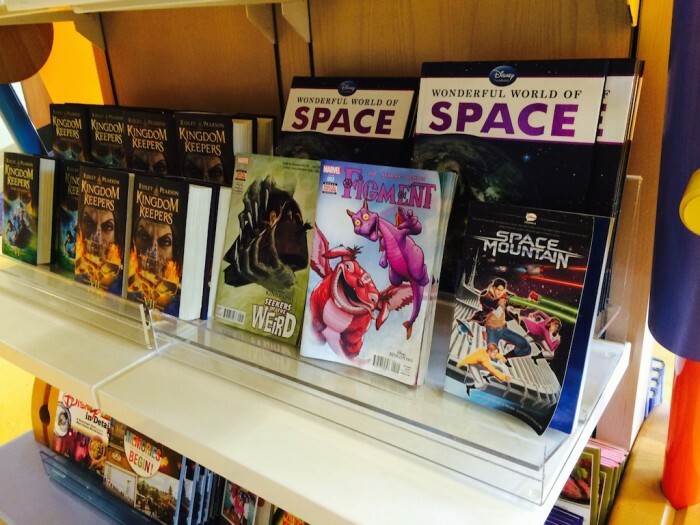 It’s shocking to see there is almost as much Hercules merchandise as Frozen. Love seeing merchandise for the “other” films in the Disney library. 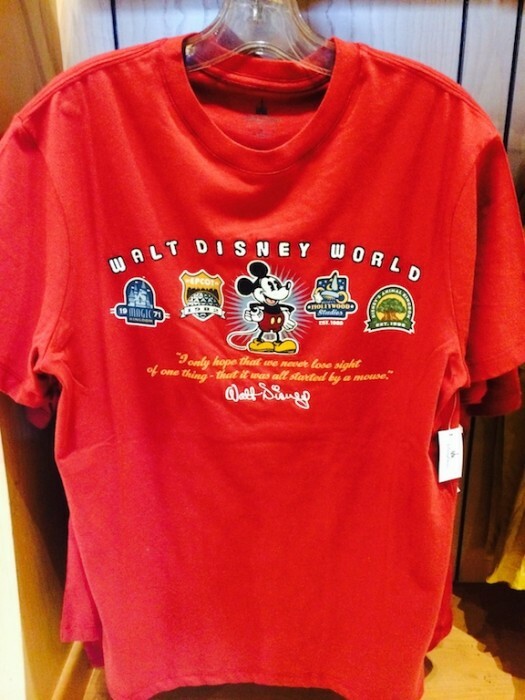 Why not make small runs of shirts for movies they re-release on Blu-ray like Treasure Planet? 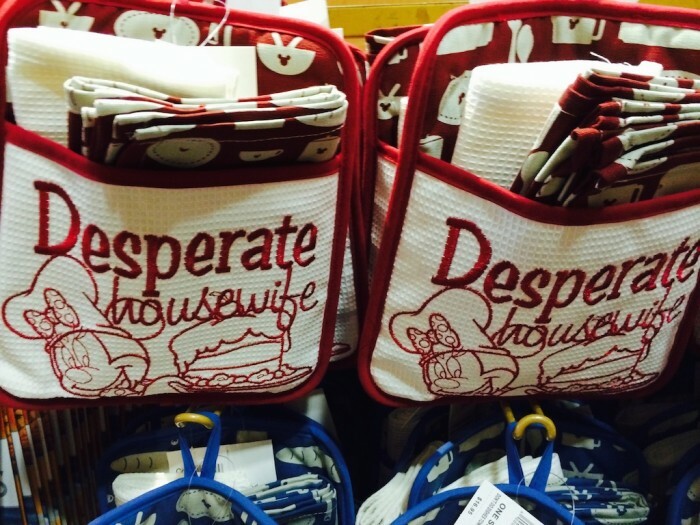 Home on the Range fans, there’s still hope for you yet…. 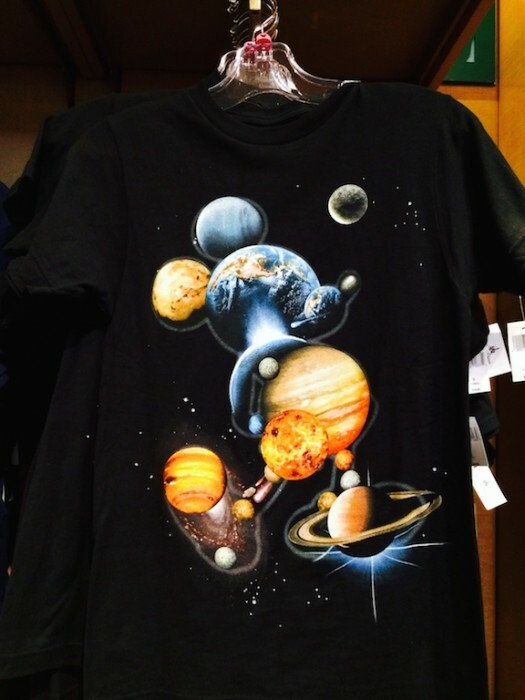 This is a Top Five Strangest Shirt of All Time. I wish Neil deGrasse Tyson would do an episode of Cosmos wearing it. 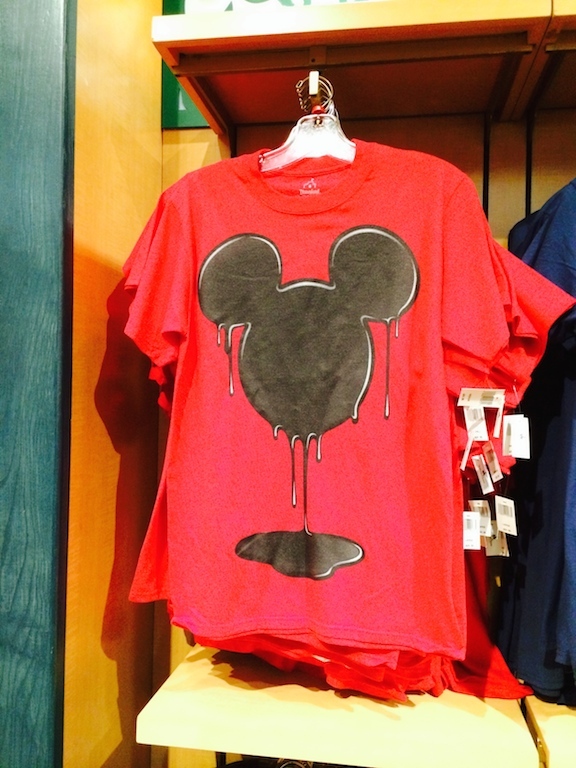 The following shirt shows you exactly what it feels like to be walking around Downtown Disney on a typical day during the summer in Florida. I really liked this style of shirt, which had logos for all four parks and what year they opened in. 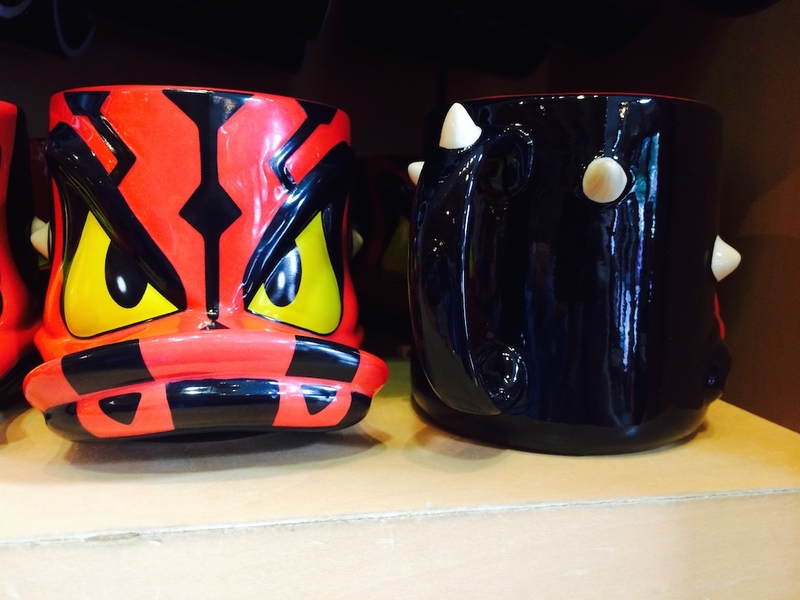 This Donald Duck-as-Darth Maul coffee cup was $18.95. I’m not a coffee drinker, but I’m assuming having a horn on the handle would be inconvenient. I actually enjoyed the television show Desperate Housewives, but I’m not sure it exactly works with Minnie Mouse. 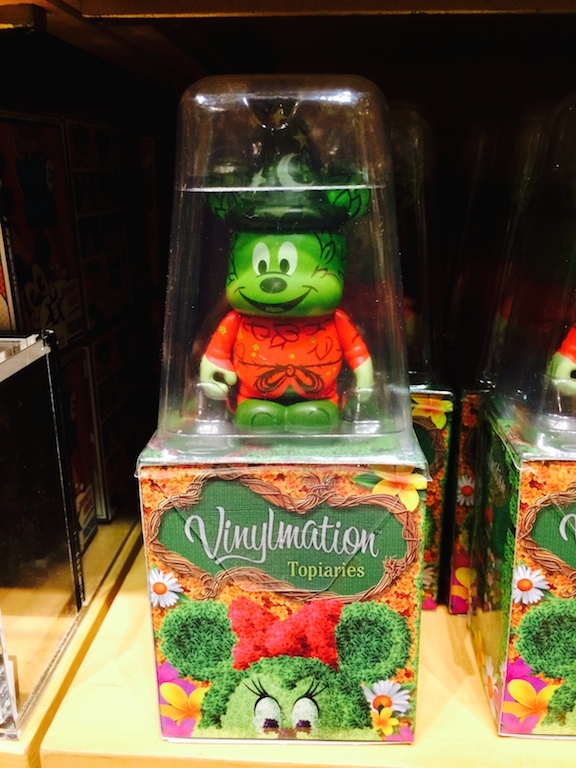 A quick run through the Vinylmation figures show us a set based on topiaries. 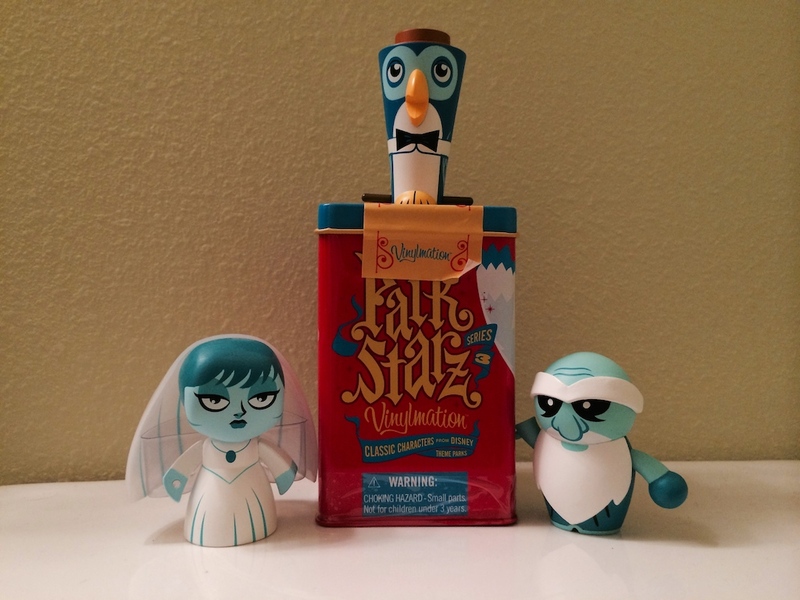 And then there is this “Ink & Paint” set, which may be the oddest looking Vinylmations I have ever seen. 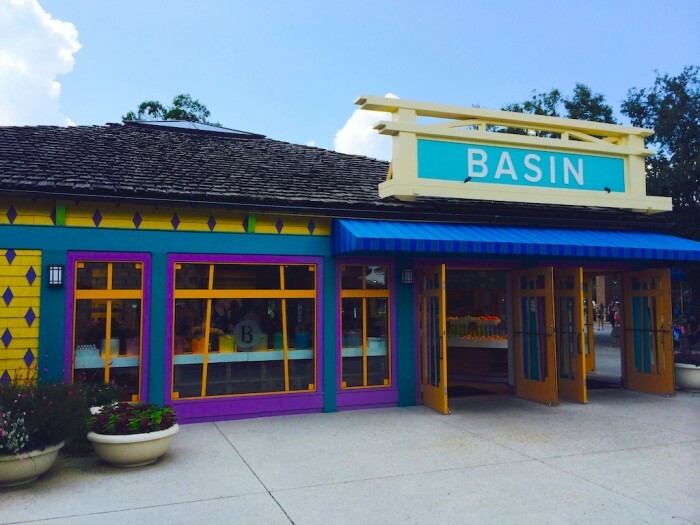 Next door to World of Disney is Basin, which sells health and beauty products. 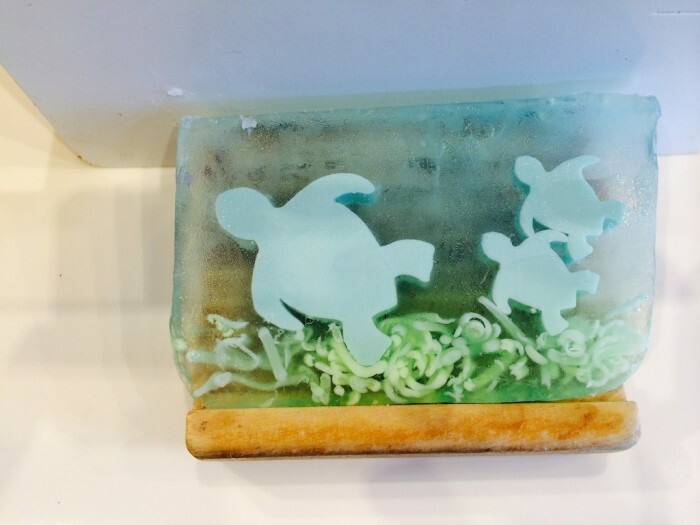 The store’s signature items are various bars of soap that have designs in them. They are sold by weight, most being $5.99/100g (the average bar will cost you between $6-$7). It’s worth walking through the store just to check out all of the different types, as several of them are Disney related. 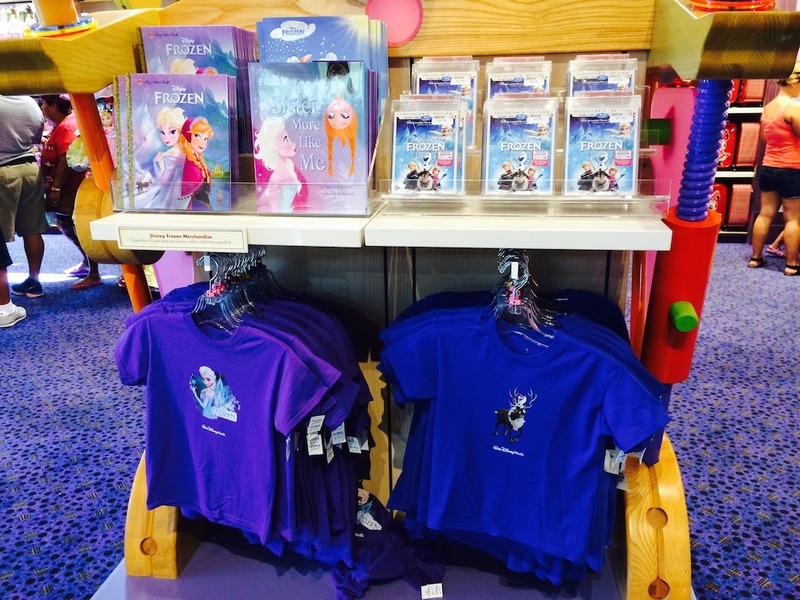 This shelf had the only Frozen-related items in the entire store outside of Anna figures for Disney Infinity. 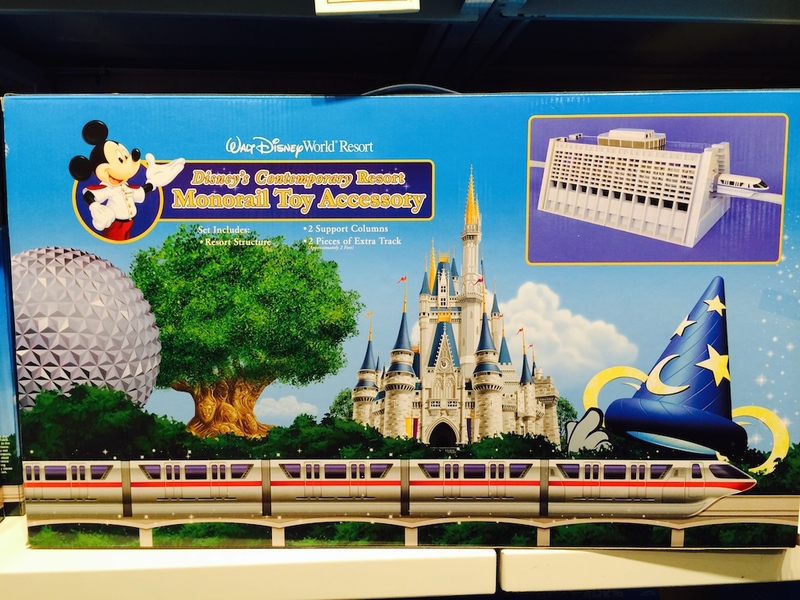 I have always wanted a Disney Monorail toy, and my upcoming stay at the Contemporary Resort next month has only intensified that desire. 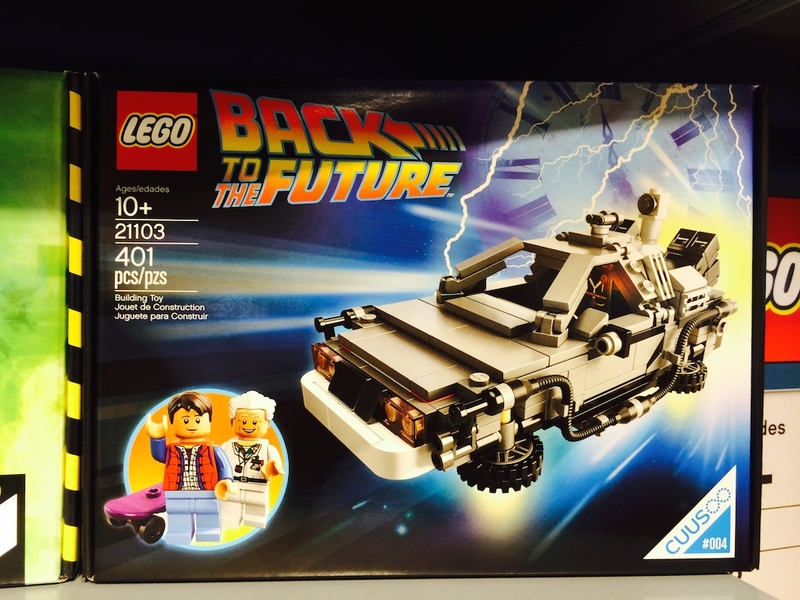 There is no logical reason for me to want this toy or any of its accessories, but I have to all but stage an intervention each and every time I’m around one to stop me from buying it. I mentioned photo-ops before, and here is another good one in-between Once Upon a Toy and Earl of Sandwich. We’ll finish part two by looking at the LEGO Store, which is located between T-REX and World of Disney and now has construction walls everywhere near it, just like Planet Hollywood. I always love seeing the Lego dragon in the water outside the store and consider it the “park” icon for Downtown Disney. 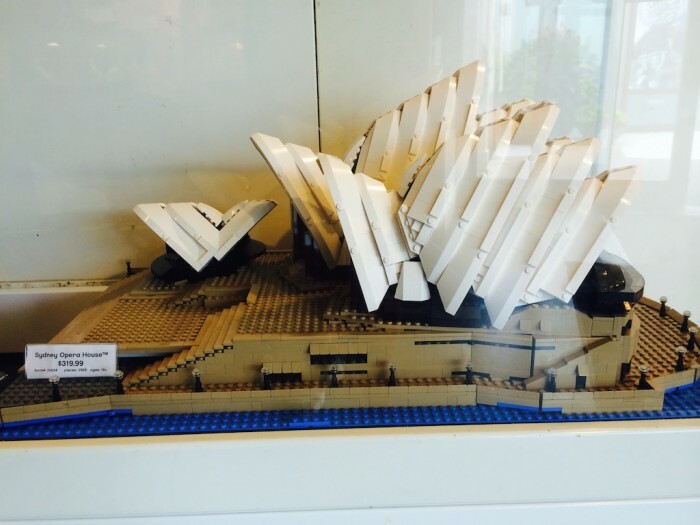 This reproduction of the Sydney Opera House runs $319.99 and contains almost 3,000 pieces. I estimated it would take me approximately 5 years to put this together. 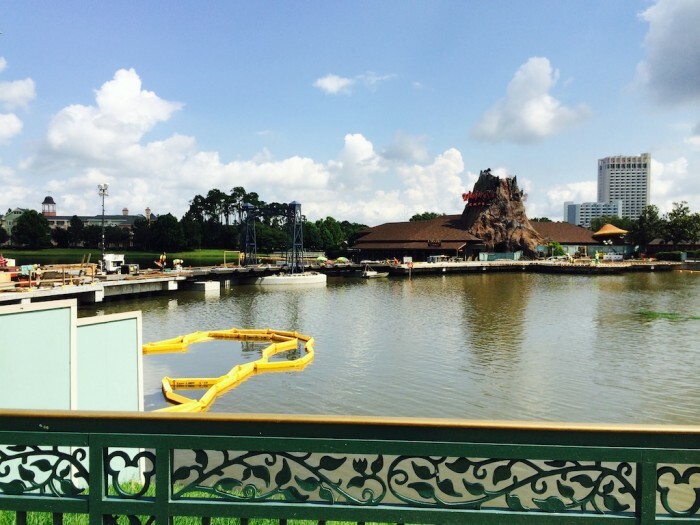 There is going to be a pedestrian walkway across the water from the area near the LEGO Store to the area in front of the Rainforest Cafe. A lot of work has been done on this, and you can see a structure in the middle standing high. 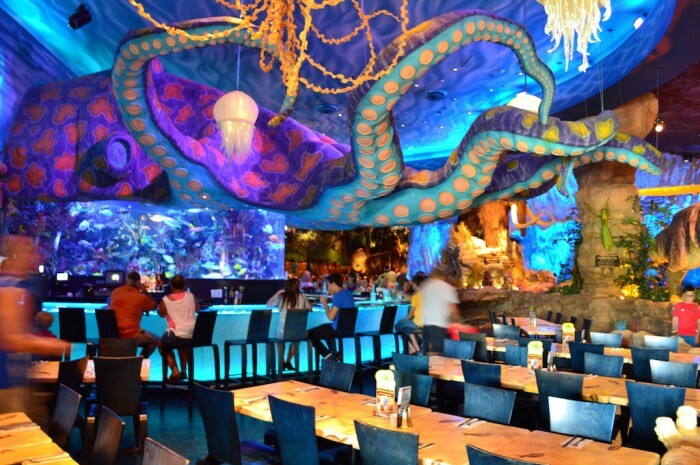 This is the same walkway as seen from the opposite side, in the Lava Lounge at the Rainforest Cafe. See you tomorrow morning, when we finish our look at Downtown Disney in Part Three, taking a look at the new Marketplace Co-op store and Art of Disney. 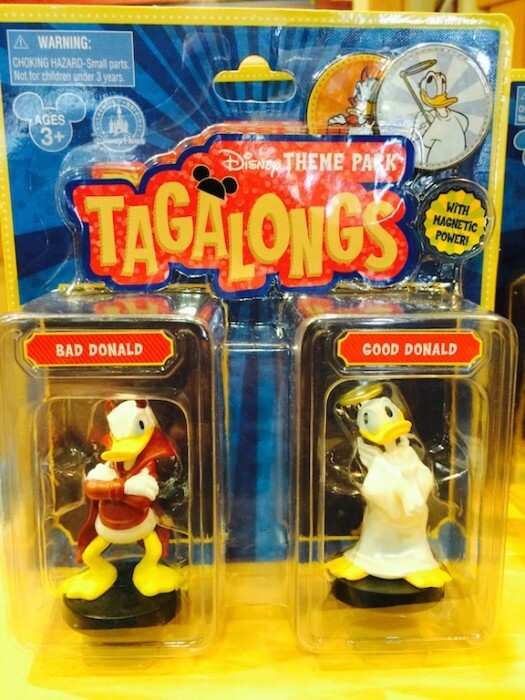 I so want the Donald tagalongs! 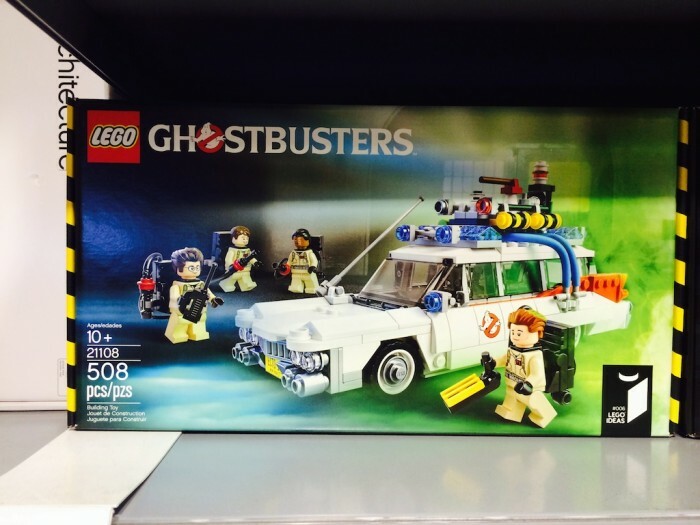 I hope I can find it there in October. Thanks again, Derek. Excellent research, sharp photography… And more jokes and references than an episode of MST3K! By the way, the Contemporary and monorail set is so worth it. I broke down a decade ago and bought it for myself. Invest in some extra track. Then a 4’x8′ sheet if plywood and 2 wooden horses. Then more track and the other pieces to complete the set. (the castle, Spaceship Earth) Then landscaping. 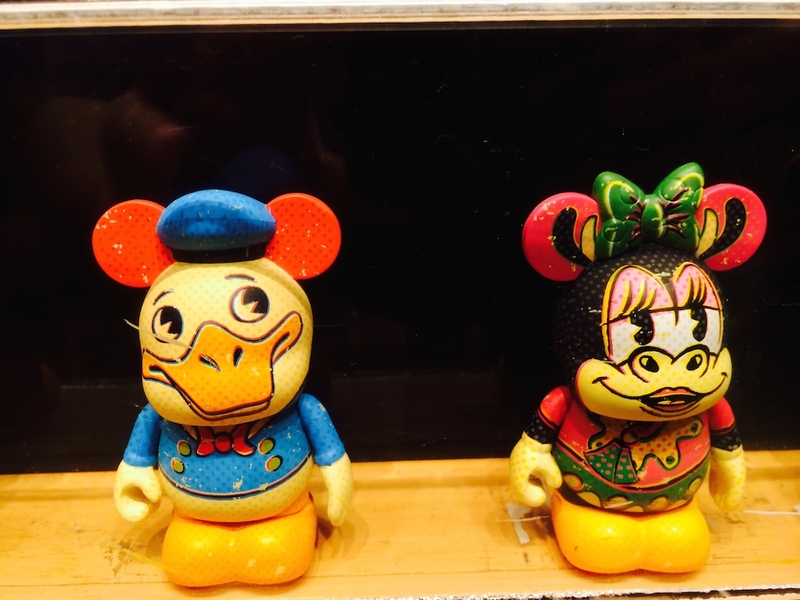 Then…..
I’ve seen pictures of a Polynesian and Grand Floridan set. This may be a rabbit hole I never come back out of. I’d not heard of the tagalongs. They’ll either be a hit or a bomb. 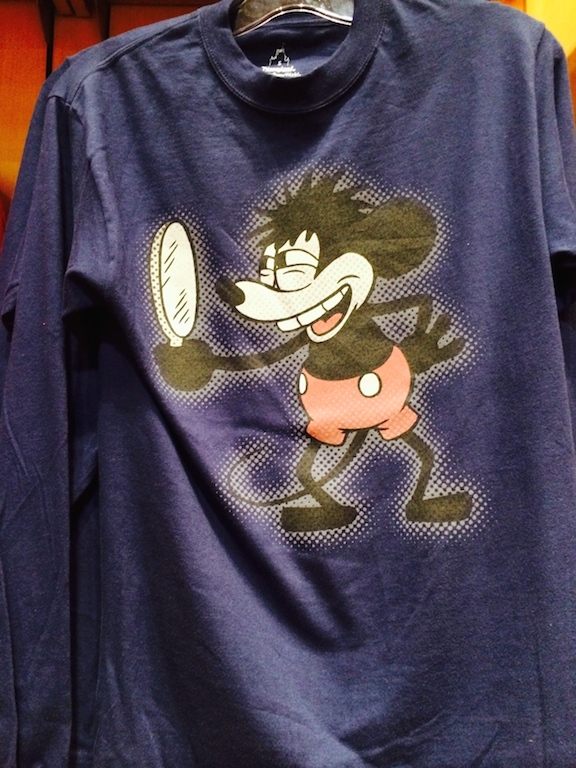 What you refer to as the “Jersey Shore” tshirt features a Mickey drawing from Plane Crazy in 1927. I made the correction in the article. Thanks Jeff. 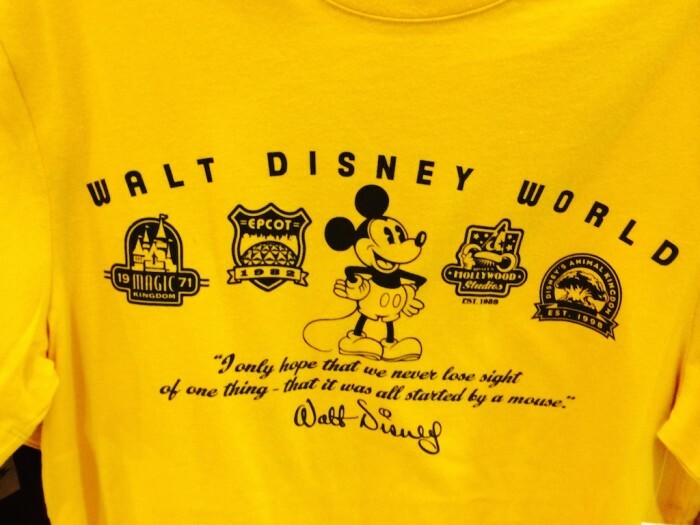 My knowledge of Mickey Mouse drawings from the 20s and 30s is lacking, but if Disney ever does a line of T-shirts based on Alf, Fraggle rock or the cartoons M.A.S.K., I will be there to spot mistakes. Fun article, thanks for sharing the updates on what is going on. 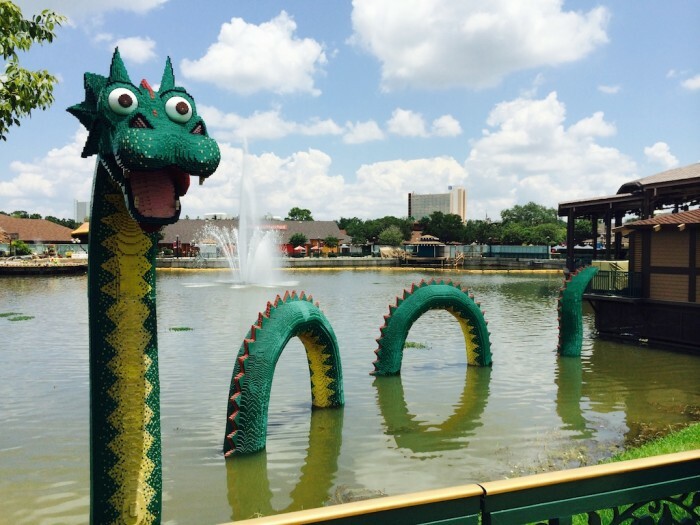 Btw the lego dragon in the lagoon actually has a name, it’s Brickley. I thought you might be interested. Thanks Mike. 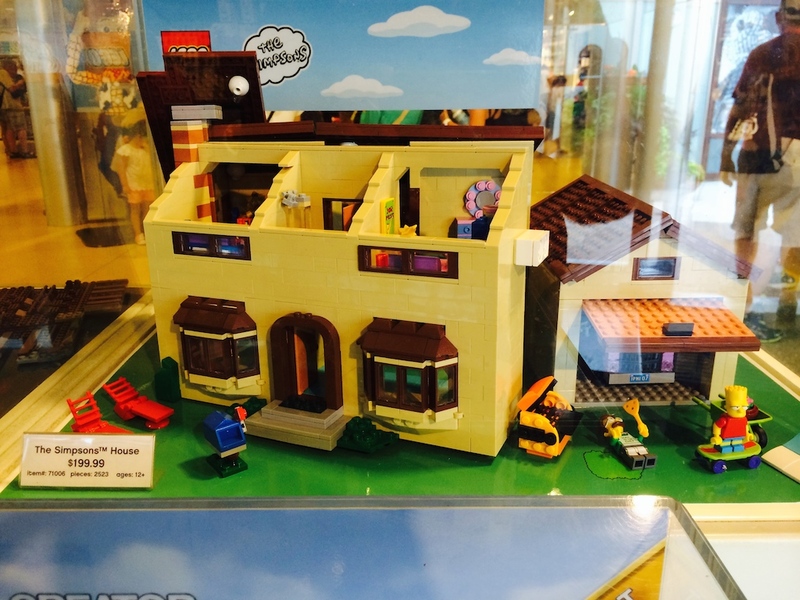 I think they for some strange reason moved all the great Brickley lego sets to the the Legoland store as the only ones available inside the DTD Lego store were the Duplo ones. 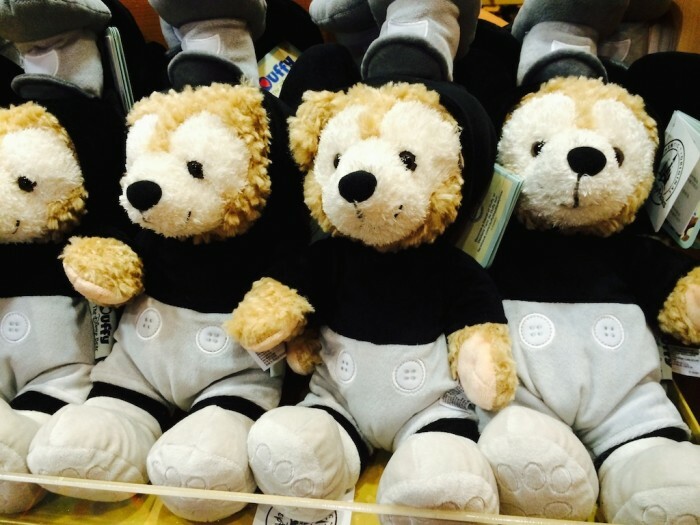 Hopefully they come back because I thought they were a great gift for family members I had brought to DTD as Brickley is certainly memorable. I’m with you on the tagalongs. Sure the magnet will keep the coin to the figure, but that doesn’t mean it will defy gravity and stay upright on your shoulder. 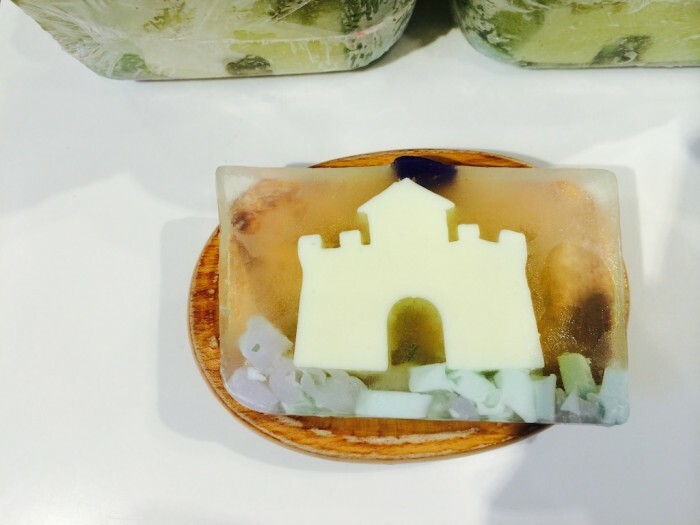 Please let us know if you try this! 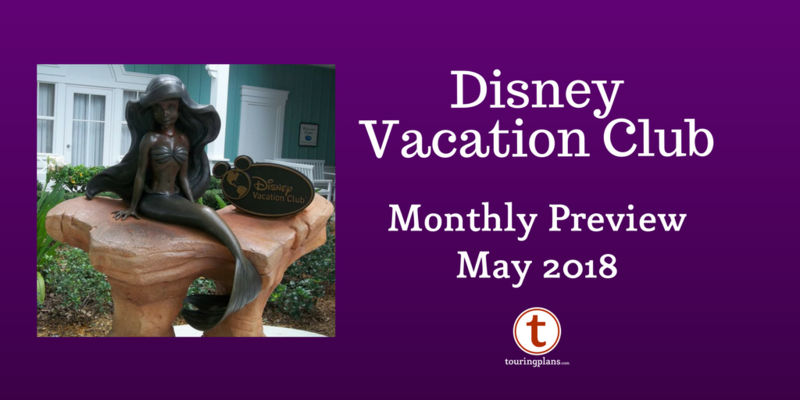 BTW – I listen Pardon the Pixie Dust every week and don’t recall this discussion. What episode was it? THANK YOU LESLIE!!!! 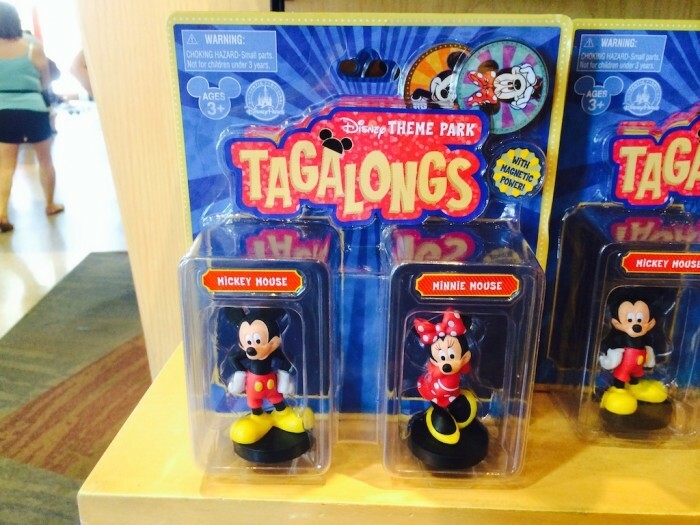 I brought Tagalongs up at the end of the Tsum Tsum discussion in the news I believe on this past week’s episode. But we have not heard the end of this! Well, that’s all I needed to hear. 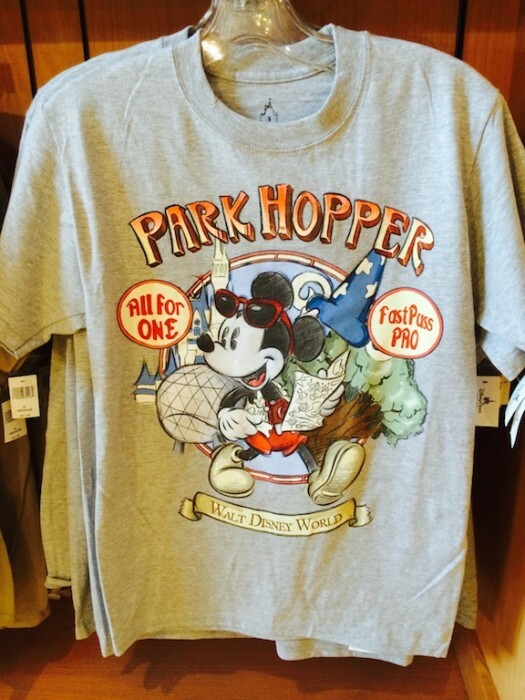 Will definitely buy while at Contemporary in September! 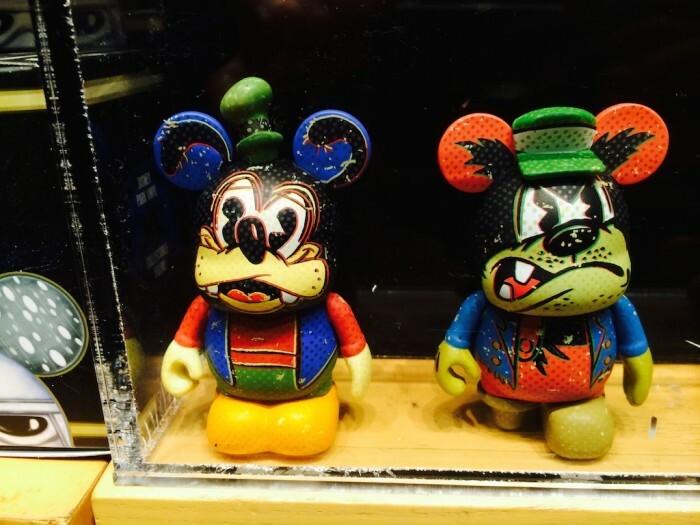 We have said that Plane Crazy Mickey is Crackhead Mickey!! !